Goodreads Monday is a weekly meme hosted by Lauren Page Turners. To participate, choose a random book from your TBR and show it off! Don’t forget to link back here and feel free to add your link to the comments section. Mel is a vampire warrior sworn to hunt and kill demons in the dark streets of Vancouver. But he’s burdened with a new assignment: find the meaning behind the Vampire Prophecy. Having no faith in the gods and their empty words, he believes there’s no truth to the ancient legend until he meets Breeana, a human woman who bears the mark of the prophecy and resembles the mysterious woman haunting his dreams. When a vengeful demon spies Breeana in his arms, she is marked for death. He must take her from the world she knows until he can eliminate the threat. 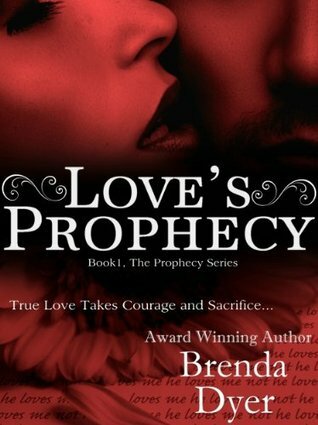 But the real danger is the role Breeana must play in fulfilling the prophecy and the intense feelings she brings out in him. Mel is forced to choose between his obligations to his kind, the world, and the woman he loves. Can he turn his back on love to let her go, or will he risk her life and bind her to him for all eternity? Veterinarian, Dr. Breeana Spencer yearns for love and companionship, but the disappointment of failed relationships have taken their toll. She now finds solace in romance novels. But when she meets a mysterious stranger, she’s drawn to him by a connection so forceful it shatters all reason, leaving her incapable of resisting him. Yet there’s more to him than smoldering good looks and a rock-hard body. As she’s drawn deeper into his danger-filled world, she learns she’s part of an ancient vampire legend. Breeana fears her future is no longer hers and will not include Mel. As their enemies close in, desperate to destroy them both, she must fight to convince Mel her place is at his side. A life-altering choice is before her—one that will take all her courage and love to make.